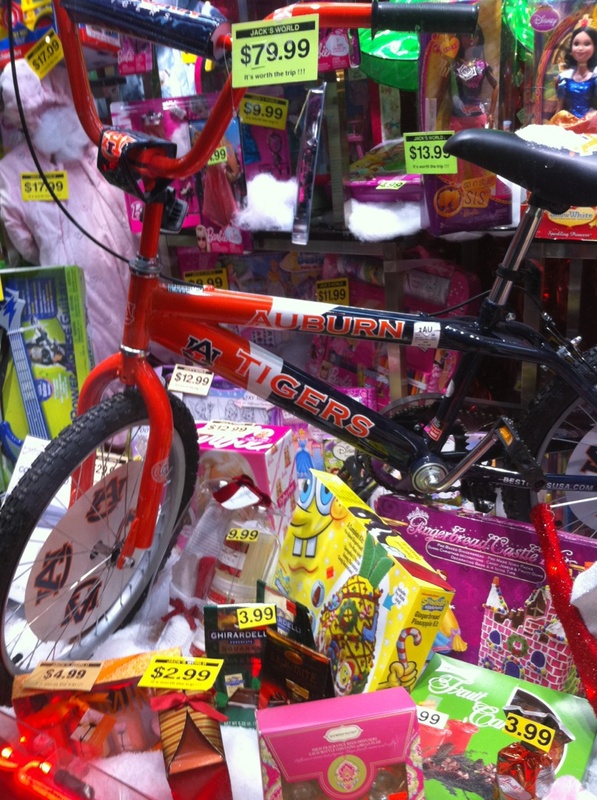 Auburn bikes topping Manhattan Christmas lists? When it rains, it pours (and when it pains, it roars, am I right Bama / Jawbreaker fans?). Here’s a recently snapped photo of an Auburn bike in a Manhattan store’s window display. We’re not making this stuff up people. The whole thing about the Big Apple having this thing for Auburn isn’t just filler for segues to the next Photo of the Day. (We respect our readers more than that.) It is very, very real. And frankly, it’s almost getting creepy. Sure, Jack’s World is apparently a big city version of a dollar store, but Jack still thinks there are enough parents walking through the streets of Manhattan who will want to buy their kids a $79 Auburn bicycle.